SANFORD, FL—A newly formed health insurance company owned by a group of devoted Calvinists announced that they will not cover any health condition, since every condition of humankind was pre-existing and established by sovereign God before the foundation of time. edit: This post was written as a tongue-in-cheek response to Mr Birch’s post against myself. I saw that his arguments could be equally used to advocate something clearly silly, and built a parody post which mirrored the arguments that Mr Birch had posted. Mr Birch has apologized for the misunderstanding my original statements, and he seems sincere. This post should be taken in jest, and just serve as a illustration that language is flexible and we should take pause before discounting a possible alternative reading of a text. 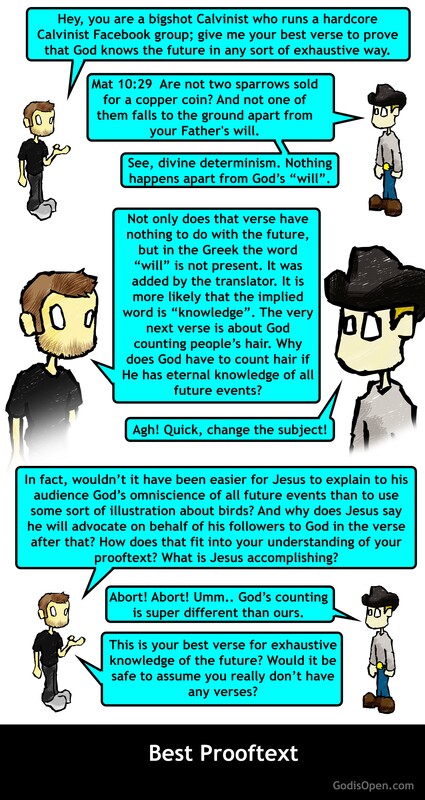 Debates about the Bible should be about what is the most likely reading from a variety of alternatives. Psa 36:7 How precious is your steadfast love, O God! The children of mankind take refuge in the shadow of your wings. This verse is probably meant to be limited in scope. “Children of mankind” probably is limited to those whom love God and are a subset of humans overall. This verse likely uses idioms and common communication norms to illustrate a principle. A parallel is being drawn between birds protecting their young and God protecting His children. It probably was not meant to be taken with a wooden reading. The context is about God’s judgments, indicating the verse is not about protecting the Earth from meteors or even about protecting “all mankind”. The wicked, presumably, are judged and are outside God’s protection. My daughter states that she enjoys my protection. She too says that she takes refuge in the shadow of my wings. And finally, I point out the context of the entire chapter is not about cosmic protection of the entire Earth from meteors. In fact, the starting of the chapter is about how the wicked will be punished. Within my original article I recount my encounter with Birch on this topic on a Facebook thread, one which he deleted. In order to avoid future claims of deleted content, and as recompense for deleting the original thread, he allowed me to reproduce his latest response, in full (! ), on my own blog (originally located here and permalinked here). Thank you, William Birch. Open Theists love their Arminian brethren — that is, as long as those Arminians are refuting the errors of Calvinism. But when those Arminians begin to refute Open Theism, that love can often turn sour, as is the case with Open Theist Chris Fisher. Take, for instance, Fisher’s latest post: “William Birch’s Disingenuous Representation of Open Theism.” This current post is one of response as well as a further refutation of Open Theistic errors. No doubt, whatever critique I offer, such will be perceived by Fisher (and perhaps other Open Theists) as merely a “disingenuous misrepresentation,” as some people tend to view any opposition to their most cherished beliefs as an overt misrepresentation, even when their opponent is quoting from primary sources. Fisher begins by noting our prior dialogue on this topic. He does not specifically note that this dialogue took place on Facebook. He suggests that our previous discussion must not have “held” in my mind, nor “does it seem to have held on the internet either (as the thread disappeared abruptly and mysterious [sic] soon after he showed disapproval of my arguments),” complains Fisher. But what Fisher fails to inform his readers is the belittling nature of his own comments toward me and others — how convenient. This, and this alone, is why I deleted the Facebook conversation. Since this is the communicative language Fisher perpetually abides then I will return the favor for his benefit. I would not, after all, want to deprive him of his own preferred narrative. Fisher, when engaging his opponents, seems to fail in resisting the use of a demeaning rhetoric, as he defends his Open Theistic philosophy to the death, one snarky comment after another. When Chris appears in the comments section of any post that is challenging Open Theism, on the Society of Evangelical Arminians Facebook outreach page, one can be certain that, by tone and by polemics, the conversation will devolve into linguistic carnality. So, yes, I deleted his comments; and, not only did I delete his comments, but I blocked him from my Facebook account. I block all toxic individuals (like Open Theist Tom Torbeyns, a fanboy of Chris Fisher, who names me a bully on Fisher’s site), irrespective of their professed Christian beliefs, when such individuals begin to demean either myself or my Facebook contacts who are commenting on any given post. So, when he comments, “I am sure the reader can divine some thoughts on why it vanished,” now “the reader” will have gained a proper perspective as to why the thread vanished, divining notwithstanding. Fisher is responding to my post, “The Confused Nature of Open Theism on God’s Protective Wings,” which is a follow-up post to the article, “The Confused Nature of Calvinism on God’s Yellow and Black Bird-like Facemask,” with which Fisher seems to have no issues. Evidently, I am not misrepresenting Calvinistic understandings of God, but I am most certainly misrepresenting Open Theistic implications regarding the same. Fisher is displeased with my brief treatment of Psalm 36, with regard to both God’s wings and Open Theistic claims, naming my engagement “a very disingenuousy [sic] misrepresentation of Open Theistic beliefs.” One wonders whether an “honest misrepresentation of Open Theistic beliefs” is even a possibility. But I digress. Fisher complains that I am misusing the text — that the author of Psalm 36 is not addressing God having feathery wings and so I, therefore, am proof-texting where I ought not be proof-texting. Let us examine the Psalm in order to see if the author addresses God’s wings. At the middle of this Psalm the author mentions clouds and heavens (Ps. 36:5), and that He currently protecting everyone with giant feathery wings, in a present tense (Ps. 36:5, 6, 7). He then states, ” How precious is your steadfast love, O God! The children of mankind take refuge in the shadow of your wings.” (Ps. 36:7, emphases added), denoting these giant wings. When I highlight the author’s words, especially as such regards God’s feathery prime facie wings, Fisher the Open Theist complains: “The Psalms verse is just not about [the] concept of God having wings, and drawing those types of conclusions is not warranted (and countered) by hte [sic] text.” So, giant wings, as noted by the Psalmist, is “just not about [the] concept of having feathery wings,” and I should know better than to assume as much. But how can I ignore such a statement from the Psalmist? If the Psalmist did not intend to convey the meaning that God has giant wings, then why would he write the phrase in such a way that so very clearly, directly and explicitly conveys no other notion than that God has giant wings protecting everyone on Earth from meteors? But you see the problem: Fisher and other Open Theists cannot assume a prima facie reading of this text because the text so very clearly contradicts their entire philosophy. When the Open Theist begins with the notion that God does not have giant wings that protect the Earth, which, by the way, must, by a logical and consistent necessity, include not protecting the entire Earth with these wings, then the Open Theist is obliged to answer passages like this one from the Psalmist to the contrary and proffer a “proper” interpretation. Fisher retorts: “Birch assumes that denying his prooftext as a prooftext is equivalent to denying that the verse is useful, a tenuous and ungracious jump in logic. There are several of these tenuous jumps of logic in Birch’s post, so bear with them.” Yes, please do bear with these alleged “jumps of logic,” as I attempt to keep Open Theists consistent with their own claims — no little feat in itself. You see, when confronted with passages that contradict Open Theistic claims, Fisher &c. must scramble for a way around the painfully-obvious explication of the author. Fisher posits that this Psalm is, “more likely,” only applicable to those who serve God. But even this point betrays Fisher: God protects His children with wings! Does Fisher not find his own conclusion problematic for an Open Theistic hermeneutic? God does not have wings, and therefore does not protect anyone with wings, including those who worship him. Fisher then proffers that the psalmist may be communicating idiomatically – a metaphor. He claims that metaphor is “everywhere” in Scripture. If this passage is a metaphor, paralleling notions of God’s relation to those who worship him, then what, exactly, is the psalmist attempting to convey? 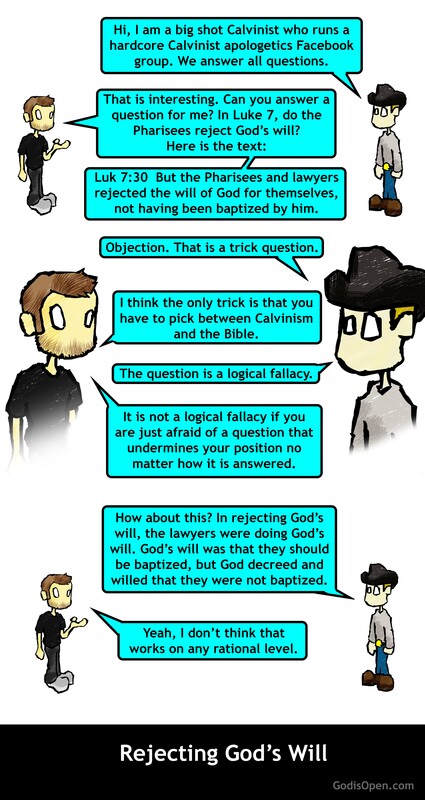 This is a contrived and desperate explanation for the Open Theist at best — the very best. Fisher claims: “This verse appears to link God’s protection to only those who serve God (as evident by the first half of the chapter), countering the claims Birch wishes to make about this verse. 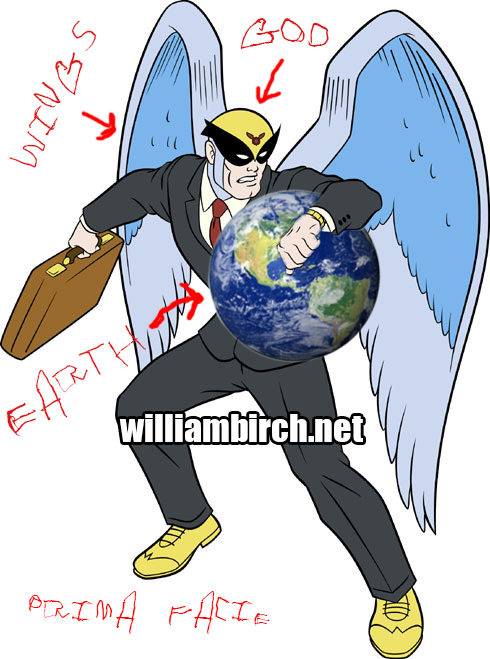 The direct context points against Birch’s claims.” This novel notion is, again, necessary in order to avoid assuming not only a prima facie reading but also admitting that God could have giant bird wings. Understand this: whatever text is presented to the Open Theist, to the effect that God has giant bird wings, protects the world with these giant bird wings, or uses these bird wings to fly, the Open Theist must present an interpretation of such passages. Most of Christendom has rejected their novel interpretations. I suppose the minority could be right. But I highly doubt it. Fisher attempts to explain the Psalmist thusly by quoting another Open Theist: ” My daughter states that she enjoys my protection. She too says that she takes refuge in the shadow of my wings.” From our perspective, this answer is trite, and fails to convey reality. To suggest that the man “has wings,” will protect his daughter with those wings, is misleading. Even if the father has wings, the likelihood of the father using these wings to protect his daughter is slim. In conjunction with the Psalmist’s notion, let us to turn to God flying Israel to Himself with eagle wings. God insists that He bore Israel to Him on eagle wings (Exo 19:4). Notice that God is the one baring Israel. How could: 1) God bare all of Israel to Himself if He was not big enough to carry them all on His back. 2) could God soar through the air if His feathers could not produce the lift necessary to carry all of Israel. There is no ambiguity in God’s words. He does not convey the possibility of not having wings. Now, the Open Theist will insist that God can bring people to Himself without wings, given unique circumstance. But, if we are to be consistent with Open Theistic claims, God could not carry Israel with giant bird wings — at least, God could not have in an absolute sense, but only in an idiomatic sense. Which indicates, of course, that God could might not be able to carry all of Israel. But let us return to Fisher’s responses. He claims that Psalm 36 is actually Open Theistic. That is, of course, outlandish. No passage in Scripture is Open Theistic, Arminian, Calvinist, Pelagian, semi-Pelagian, Roman Catholic, Lutheran, Anglican, or otherwise explicitly teaching a particular position. Fisher’s comment is, simply, naïve. Evidently, Chris Fisher needs a refresher course on Hermeneutics. The Open Theist, the Calvinist, the Arminian, the Lutheran, etc., opens the text of God’s word and interprets that word through his or her respective presuppositional grid. Fisher’s naïve confession is no better than that of the Calvinist, who makes a similar declaration, against whom the Open Theist objects. Fisher believes that, at Psalm 36, God “only protects those who worship Him.” True enough, but then the text says God protects everyone with giant bird wings. (Ps. 36:7) Fisher tries so very hard to make the Psalmist say what the Psalmist is not saying that the attempt appears so very obviously desperate. But Fisher’s “not having wings” a priori is key to his hermeneutic: God does not protect the Earth from comets with giant wings. See, the Open Theist God is without giant, protective wings, so this God protect His people in some other manner. In my understanding, God tests people not so that He might understand us better, but so that we might understand both ourselves and God better. Unless we are thusly tested, we are the ones who remain without sufficient and proper knowledge, both of ourselves, in our fallen context, and of our loving and gracious and merciful and redeeming Triune God, in Christ, by means of the Holy Spirit. Again, Birch assumes God is more incompetent then [sic] humans. Normal human beings can protect each other. Just the other day I told a Calvinist that I was going to bring my son to his hospital appointment unharmed, and everything happened as said. This is not unusual. Normal people say things like “my hand will protect you” or “America can sleep safely under the wings of our military”. In fact, entire fables use wings and metaphors to paint parallel pictures to normal protective acts. Fisher’s sophomoric and faulty assertion should be obvious even to the novice: protection is not tantamount to giant eagle wings. Fisher’s comment here is like equating wishful thinking to faith. ” Just the other day I told a Calvinist that I was going to bring my son to his hospital appointment unharmed, and everything happened as said.” I am, quite literally, astonished at the level of ineptitude of this comment. What Fisher did not, obviously, protect from was all the contingencies that could have occurred and, hence, could not have truly protected his son when taking him to the hospital appointment. In no sense whatsoever could Fisher insist that he could actually protect his son; and to equate this quasi-protective circumstance to God’s giant, feathery protective wings is an embarrassing elementary mistake. For those Open Theists who complained about me quoting from Open Theist scholars rather than Chris Fisher and Michael Saia, this is why. I would no more expect a Calvinist to quote from my writings on this blog, in lieu of quoting from accomplished Arminian scholars like William Klein, Keith Stanglin, Thomas McCall, Brian Abasciano, Thomas Oden, Grant Osborne or I. Howard Marshall than I should be expected to quote from Open Theist bloggers who are not published. One might ask: Then why are you expending so much effort in this post answering Chris Fisher? I will tell you why: Because Fisher is himself disingenuous regarding my post, my interactions with him on Facebook, and in his own response on his blog. I think his readers deserve another perspective of the matter. However, the point is well taken, in that further addressing Fisher could be considered entirely superfluous. I do believe for future reference I will only address Open Theism from its accomplished scholars. Again we gain insight into the naïveté of the mind of the Open Theist blogger. References in the New Testament toward “knowledge of the truth” proper regard the Christian faith. (cf. 2 Thess. 2:10; 1 Tim. 2:4; 2 Tim. 3:7) If Fisher thinks that Open Theism is synonymous with Christian orthodoxy then he is self-deceived at best and blinded by the Enemy at worst. While I appreciate the prayers of Fisher and other Open Theists, I assume I will be forgiven for doubting Mr. Fisher’s sincerity, because of past engagements with him. His reputation lacks sincerity when engaging his opponents and so I have no confidence whatsoever that God will be hearing any prayers on my behalf uttered by any Open Theist who reads Fisher. From a consistent Open Theistic stance, I have little doubt that God Himself will be surprised by such prayers, since He presently has no idea what the Open Theist will actually do in the future. I do pity the advocates of such an inept philosophy. Thus ends Birch’s post. Tomorrow I will discuss a few notes about William Birch. Next week, I will list out a series of basic reading comprehension questions which caused him to delete a very tame Facebook conversation. In short, sir, theological speculation is what we do, and we do it with unfettered enthusiasm. It is clear to us that your particular academic credentials do not qualify you to determine what speculation IS or IS NOT “unwarranted.” We do not find your dismissive remarks regarding our dubiously accredited guild to be lacking in disturbance and insensitivity. We here at JEST encourage speculation as often as is warranted by the nature of the topic itself. The only instance that speculation could possibly be rightfully considered “unwarranted” would be in the absence of a dearth of biblical, textual, or other scholarly support. That is to say, scholarly evidence is the only thing that can “unwarrant” speculation. We advise that the topic be removed from the realm of actual scholarship and placed squarely in our field of speculation, where it rightfully belongs. Pete became sick today after lunch. I don’t always like my brother, but I wish he felt better. He says his stomach hurts, and he wishes he could throw up, but he can’t. Dad came home from work and told us that he put something in Pete’s lunch to make him sick. Pete asked why? Was it something he did? Dad said no, it didn’t have anything to do with anything Pete did. He says he did it to show that he has control over everything, and he can give or he can take away, as he wills. He gives us all our food, and so if he wants to do something to the food, he can if he wants. Then he said he loves Pete and me, and we can trust him to always do the right thing for us. Is the right thing for Pete for him to be sick and hurting? Why, daddy? I asked Dad if he was going to hurt me like he hurt Pete. He said he wouldn’t tell me, but you never know. The whole document is worth a read. For full document, click here.